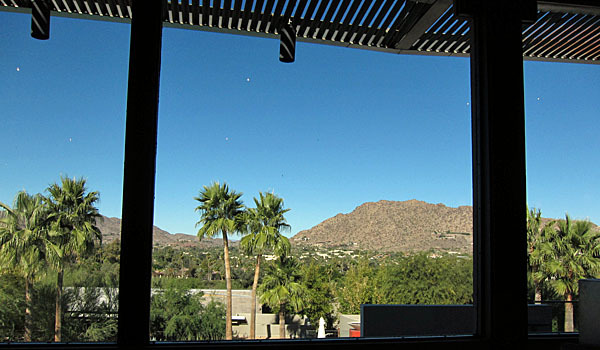 To celebrate the holidays, my co-workers and I decided to go to Elements at The Sanctuary resort on Camelback Mountain in Paradise Valley for a change of pace from our usual quick take-out run to Baja Fresh. It’s definitely a “special occasions” or “date night” kind of place, especially if you’re dining with omnivores and want a good vegan meal for yourself as well. Because it’s a health-focused resort, I can actually order vegan food from the menu at Elements rather than having to ask the chef to make something for me like I do at most high-end restaurants that I’ve frequented for work events. Nine out of teb times that “something” ends up being a plate of roasted or steamed vegetables for the price of a steak. To start with, the view at Elements is just gorgeous. If you go for dinner, try to be there for sunset and get a table by a window. I’ve never stayed at the resort but apparently it’s one of the finest in Phoenix. The grounds are gorgeous, with buildings tucked into the landscape. It makes you forget you’re in the middle of one of the largest cities in the U.S. Since I was with my team, we were able to share a couple of appetizers that I believe were vegan. They have a daily chef’s hummus, and for our visit it was garlic hummus. I’ll admit I was a touch nervous because I don’t like my hummus to be overwhelmed with garlic, but this was scrap-the plate-clean perfect. 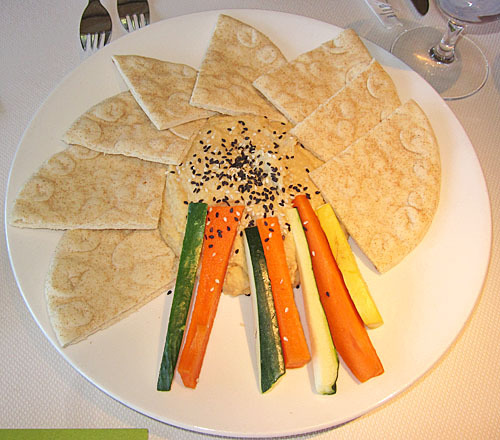 We liked it so much that we used the amazing bread they served to scoop it up when we ran out of pita. 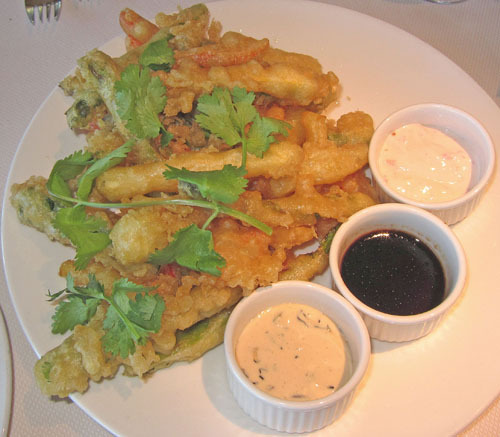 We also ordered the tempura vegetables. Two of the dipping sauces were not vegan, but the soy ginger sauce in the middle was, and it was great. 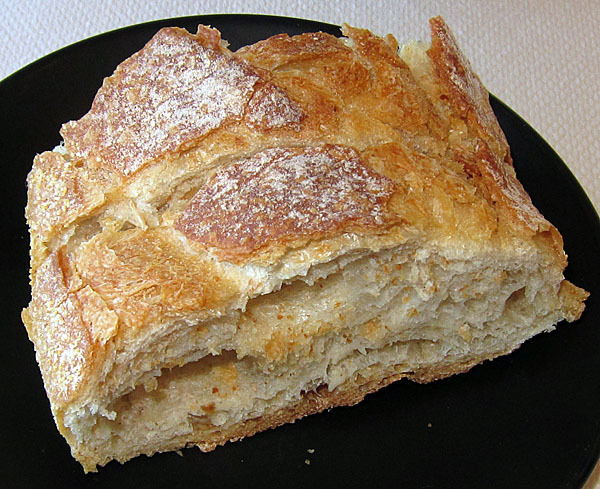 The breading on the veggies was fairly thick – a bit more than I’m used to – but not overly greasy. I did not ask specifically if it was vegan though. For my entrée, I ordered a barbeque tofu bento box, which included miso soup as well. Of course by this point in time I was already stuffed, so I appreciated that it was fairly light. 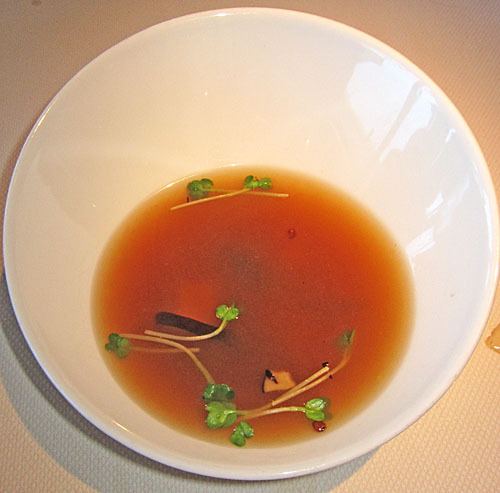 The soup was basic, but rich in flavor, without being too mushroomy. I did confirm that the soup was vegan — no random fish stock or shrimp flakes in it. 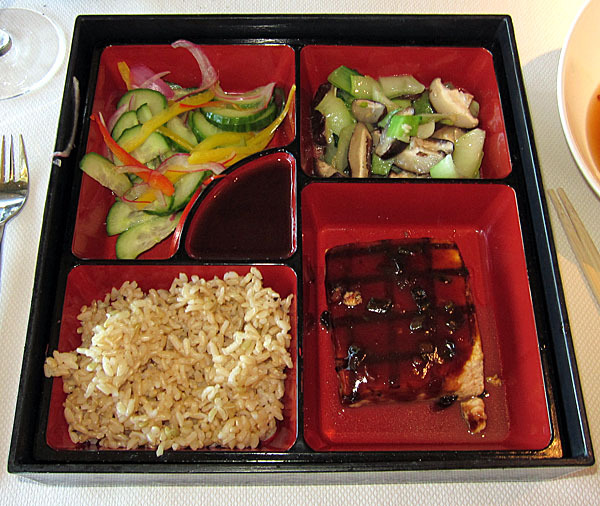 The bento box came with a big chuck of grilled tofu with a light barbeque sauce, plus brown rice, steamed vegetables & a pickled cucumber salad. I understand the aesthetic value of serving a big block of tofu, but I’d prefer smaller pieces that are cooked through a bit more, and covered in more sauce to give the dish greater flavor. The veggies and rice were fine, but they really needed to be dipped in the sauce served with the box to bring them to life. 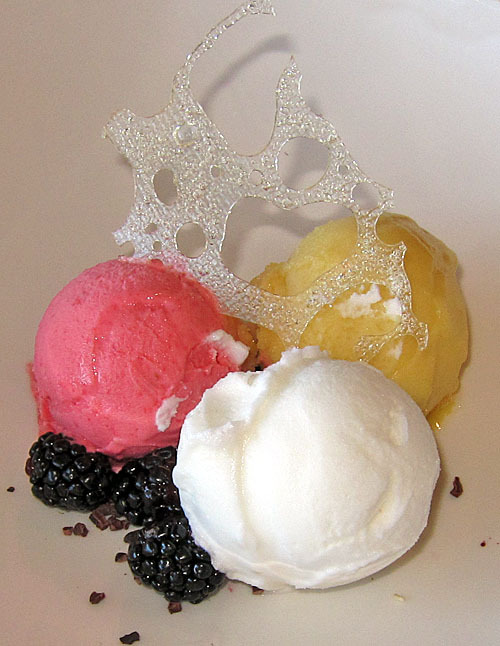 Despite feeling like an over-stuffed Christmas stocking, I ordered a “light” desert of one scoop of sorbet. But, the waiter decided I should have a chance to try all three of their flavors. I could only handle a bite or two of each. They were lemon, raspberry and mango. The mango sorbet got most votes from around the table. It was heavenly. While we really enjoyed the location, plus the quality and presentation of the food, the service was a bit lacking given the foo-foo-ness (and expense) of the restaurant. It wasn’t very crowded, but the service was pretty slow, and just not quite “on it” with requests. Overall, if you’re looking for a high-end place to go to in Phoenix that speaks “vegan,” Elements is a good choice, but it’s not a place I’ll put in my regular eating-out rotation. It’s also worth going to just to enjoy the scenery from the bar if you’re not up for a full meal.